Mine Cart Madness is the twenty-seventh level of the game, Donkey Kong Country. It is also the fifth level of the Kremkroc Industries, Inc. area. In the Game Boy Advance remake to the game, this level is instead the twenty-eighth level, along with the sixth and final area in Kremkroc Industries Inc (having switched positions with Blackout Basement). This boardwalk level is very similar to the earlier Mine Cart Carnage. This time, the Kongs ride the Mine Carts in the same manner as before, but, when they jump, they exit the cart and are sent into mid-air, unlike in Mine Cart Carnage, where they jump along with the cart. The Kongs must get used to jumping out of their cart independently as many Zingers and Neckies get in their way. Four Gnawties also appear in the level, three of which that are found at the start of the level and the other at the end of it. Sometimes, the Kongs must leave their cart for good and land in a different Mine Cart, due to their Mine Cart about to roll into an abyss. They must sometimes hijack a Krash's cart later in the level to gain access to another cart. 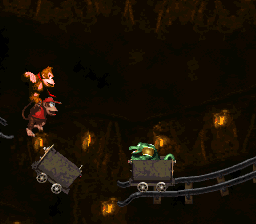 At the start of the level, the Kongs must pass or defeat three Gnawties and pass a DK Barrel along a set of scaffolds, then hop into a Mine Cart to advance throughout the level. They are then pulled past a Necky, then another. Next, the track becomes a dead end and the Kongs must defeat or pass another Necky and hop into the second Mine Cart of the level. Donkey and Diddy Kong must then nab the letter K between two Neckies and continue along throughout the level. They can either jump onto the Mine Cart on the shortcut by climbing up a rope, which takes them past the Neckies below, or they can take the hard way with Neckies as obstacles. On the secret path, they can collect many bananas and/or enter the Bonus Barrel above them, while on the lower path, they ride over a small ramp that sends them over some of an abyss. After riding through either of the pathways, Donkey and Diddy must hop over a Zinger to go into the next Mine Cart of the level. After defeating or passing a Necky, they encounter two more Neckies that they can bounce on to collect the letter O. The Kongs must then jump into another Mine Cart, where they temporarily go upwards and must only avoid a single Zinger to move onto the next Mine Cart. After this, they must hop into two more Mine Carts on two short tracks, until they reach a Mine Cart on a longer track, which leads the duo to the Star Barrel. The Kongs hop into a Mine Cart. Halfway throughout the level, the Kongs must fall downwards off of the edge of a track to land in a lower area with a DK Barrel and two Neckes that they must jump over or defeat. Then, they encounter a line full of Mine Carts on short tracks, as well as the letter N after riding in the two Mine Carts on short tracks. They must then hop into another Mine Cart to continue throughout the Mine Cart level. The primates can find a tire high up in the air in which they can jump onto to hop into the second Bonus Barrel. They may ignore it and then avoid two Zingers until they reach the deadline of the track. The Kongs must then jump onto a tire on a nearby platform, which helps them jump into another Mine Cart leading between two Zingers. Afterwards, the Kongs must hop onto another platform, avoid a Zinger, and, optionally, collect the letter G with a tire on the platform. When the Kongs are done doing this, they must hop into another Mine Cart, which travels a far way downwards until reaching another platform with a tire and a Zinger around it. The Kongs must then hop off this platform and into another Mine Cart containing a Krash on a short track leading the Kongs to another two platform with a tire on each. A Zinger on whom the primates must avoid is also between them. The Kongs must then hop into a Mine Cart containing a Krash, defeat it, then continue along until reaching another short platform supporting a tire. A Zinger flies to the left of it. The Kongs must then hop off this ledge and into another Mine Cart containing a Krash on whom the Kongs must defeat. The Kongs continue upwards in the Mine Cart and must avoid a trio of Zingers. They must then hop out of the Mine Cart and into another Mine Cart with a Krash in it. They must defeat the Krash and continue along throughout the level under a Necky, until reaching another small platform supporting a tire with a Zinger circling around it. The Kongs must avoid this enemy and hop far down and into another Mine Cart with a Krash in it, whom the primates must defeat. The primates are then lead far up and far down in the Mine Cart, making an upside-down U-turn. They can hop into a Barrel Cannon in the middle of the U-turn, found below the exit sign on the track, which leads them to the final Bonus Level. They must then finally jump off of the Mine Cart when they reach the downward part of the U-turn and defeat a Gnawty on a long scaffold. The duo must then hop onto another ledge leading them past the exit sign to the next level. The Kongs jump toward the letter "G"
K: The letter K is found between two Neckies near the second Mine Cart of the level. O: The letter O is found in the Mine Cart after the shortcut and the first Zinger of the level, above two Neckies. N: The letter N is found after the Star Barrel in an abyss next to a Mine Cart on a short track. G: The letter G is found above the first small platform with a tire after the second Bonus Level. At the beginning of the level, the Kongs must grab the letter K and dodge two Neckies. Afterwards, they begin to ride downwards. There, they must jump up and grab onto a lone rope. Jumping off of it to the right takes them to another Mine Cart. In the center of the track with bananas, the Kongs must jump up and land in a hidden Bonus Barrel, leading them to a Bonus Level, where they must blast through several barrels to grab a few special items, including an Animal Token. They can exit the area through the opening at the end of the stage. Shortly after the letter N, the Kongs notice a tire floating in the air. They must jump to it when they come by and bounce into the barrel to the right. This shoots them to another Bonus Level, where they must hit three barrels so the images of Animal Tokens displayed on them all match. Once this is done, they are awarded with an Animal Token that's type depends on the Animal Buddy token they matched. Next, they are led to the main level. They are also forced back to the main level if they fail of make a perfect match. Upon exiting the final mine cart, the Kongs must turn around and jump past the track to land on a floating tire. They must use it to bounce to the two next tires and then into a barrel that blasts them to the Bonus Level. There, the they must bounce on another tire on a moving platform to grab many bananas over a wide abyss. The Bonus Level's exit is to their right. The Kongs exit their cart and jump into another. The Kongs ride close to a Necky. The Kongs approach the Star Barrel. The Kongs jump into a Barrel Cannon that leads them to the final Bonus Level of the level. This page was last edited on April 9, 2019, at 18:30.